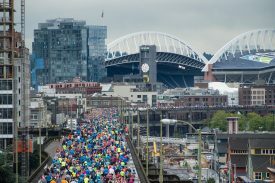 SEATTLE – June 16, 2017 – The 9th annual Alaska Airlines Rock ‘n’ Roll Seattle Marathon & ½ Marathon, a signature Seafair Event returns this weekend (June 17 – 18). For the first time in the event’s history it will feature two days of racing with the Rock ‘n’ Roll 5K presented by Brooks taking place on Saturday, June 17 at 9:00 a.m. and the marathon and half marathon on Sunday, June 18, which takes off at 6:30 a.m. More than 18,000 participants from all 50 states and 30 countries will toe the start line at Seattle’s premier running event. The new Alaska Airlines Rock ‘n’ Roll Seattle Marathon & ½ Marathon course will take off from Montlake Blvd. before crossing over Montlake Bridge. Next, runners will head through Washington Park Arboretum followed by Madison Park neighborhood where they will be greeted by beautiful views of Lake Washington. The race will continue with marathon racers breaking off towards Seward Park before joining half marathon participants on Rainier. The marathon will then continue on the Viaduct. Both courses will finish at CenturyLink Field. The 5K will start and finish in Tukwila at The Museum of Flight and will feature a flat and fast course on E Marginal Way. As with any Rock ‘n’ Roll Marathon Series event, live entertainment will keep the energy high along the 3.1 mile course with a finish line festival greeting runners at the end. All 5K participants will receive free admission to The Museum of Flight on race day and their guests will receive 10 percent off admission. With a second day of racing added, participants will now be able to take the Remix Challenge. Anyone who completes the Saturday 5K and the marathon or half marathon on Sunday will earn the coveted Remix Challenge medal in addition to each race’s finisher medal.